Peppered Pork Tenderloin in Red Wine Sauce, quick, easy gourmet recipes. 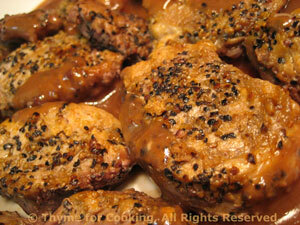 The pork is an economical variation of Steak au Poivre. 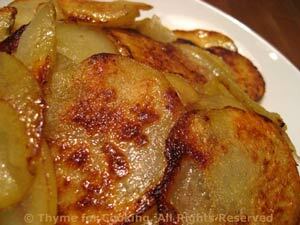 Thinly sliced raw potatoes, sautéed, undisturbed, in a large skillet. Let them get nicely browned, turn once or twice and finish with a sprinkle of salt. They are creamy on the inside; crisp on the outside and incredibly easy. Melt the butter in a large nonstick skillet over medium-low heat. Add the potatoes, arranging in layers. Drizzle the oil over the top. Allow to cook for 15 minutes (Reduce heat further if they start to get too brown). With a spatula turn in sections - don't worry about being neat. Continue to cook for another 10 - 15 minutes, until potatoes are done and nicely golden. Remove, add salt and pepper if you feel so inclined, and serve. 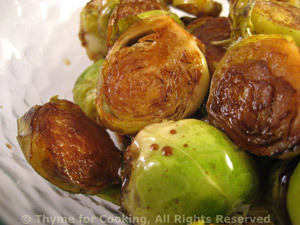 Cut in half and fried in olive oil, then finished with soy sauce and vinegar.... Not your usual Brussels Sprout. Slice off stem end of sprouts and remove any wilted or damaged leaves. Cut each sprout in half through the stem end. Heat oil in a medium nonstick skillet over medium-high heat. Add sprouts, cut side down, and sauté until lightly browned and crisp-tender, 7 - 10 minutes, checking occasionally so they don't get too dark. Turn and sauté on the other side for a few minutes longer. Combine soy sauce and vinegar. Add to skillet and turn the sprouts over to coat, letting simmer, cut side down for 2 - 3 minutes longer. Serve.